SERVICE FEE is paid directly to Home-away. No car needed to enjoy all the Village of Greenport has to offer. Walk to everything! 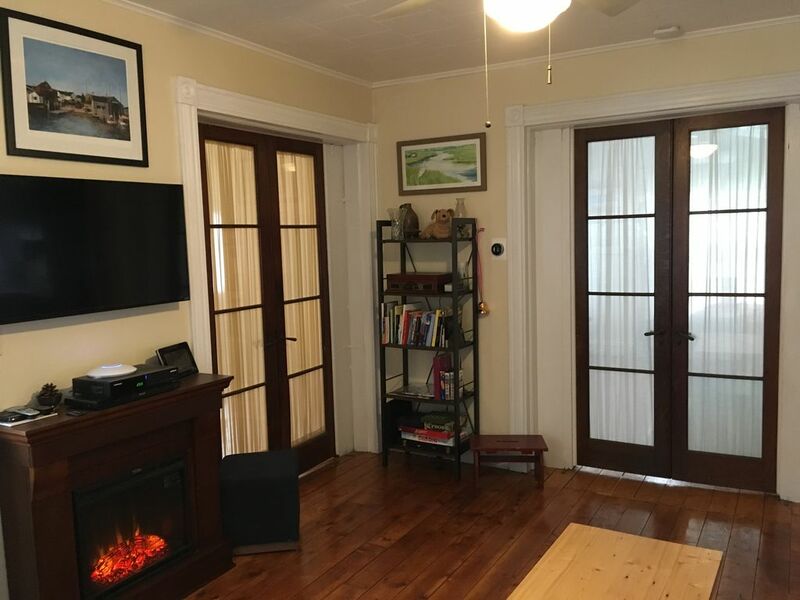 Less than 5 minute walk to the fabulous Greenport Harborfront, Mitchell Park with Carousel and Seasonal Ice skating rink, Brewery, year round boutique shopping, and year round casual to fine dining. Individual room air conditioners for two bedrooms provided in summer. Ceiling fans in bedrooms, living room and kitchen. All bed linens included. No maid service. Laundry room provided. No maid service. Laundry room & Laundry soap provided. No maid service. Laundry room provided. Bath and Beach towels included. No maid service. Laundry room provided. Large Kitchen island accommodates 6 people. Large patio table with umbrella and seating for 6. DVD player and movie collection provided or bring your own device or DVDs. Apple TV & Roku devices. small selection of books, Adult coloring book by local GPT artist & colored pencils. Wrap around covered front porch, Large backyard deck with railing, Gas fire pit, Gas grill, patio table with umbrella and seating for 6+. Cozy and comfortable accommodations right in town. Jim and Mindy were wonderful. Highly recommended ! Terrific stay - beautiful apartment, great location. Great hosts - Mindy responded immediately to any questions. The apartment was supplied with everything one could need - from olive oil to beach umbrellas. All around great experience. Our family thoroughly enjoyed our stay at Porch-on-Front. It was quite lovely – clean, neat, tasteful and cozy. Everything you could want! It was convenient, too – within a short walking distance of downtown, the ferry to Shelter Island, the beach, and more. The owners were very, very thoughtful and nice. It felt like home for the days we were there, and we hope to return another time. Our weekend (6 girls) was made even better by staying at Porch on Front. Jim was waiting for us to arrive (got to check in early!!!) and Mindy was in contact and accessible by text at a moment’s notice- amazing hosts, everything was just perfect. Porch On Front was a great choice for us in Greenport. The apartment was clean, spacious and charming. The location was great; a short walk to town. Mindy was so nice, she stocks the apartment with everything you may need. I highly recommend Porch On Front for anyone looking to stay in Greenport! Easy walk to town. Hampton Jitney (between NYC & Greenport) & Long Island Railroad are both within easy walking distance. The SERVICE FEE is paid directly to homeaway. One Night Stay available but will incur a surcharge as follows: $100/Night on Fri or Sat. in July & August Taxes are collected as follows: 3% Suffolk County hotel motel tax 4% New York State sales tax 4.625% Suffolk County sales tax Taxes are not negotiable, sorry I don't look good in stripes! Bookings canceled at least 30 days before the start of the stay will receive a 100% refund. Bookings canceled at least 14 days before the start of the stay will receive a 50% refund.